Got the coolest email today and just had to share it. I love celebrating the successes of our students. Tyler Steeland came to an Elite Performers Boot Camp August 19th and 20th. So Tyler has been doing all the throwing/mobility/workout drills you gave him after we left your camp in August following your program every day. He gets in the garage turns his music up and works his tail off. He has been playing fall ball and recently went to a PG event and had the best pitching outing he’s ever had. His best velo going into your program was 72MPH..but at a recent event hit his goal of 80!!! See attached. I just about hit the floor when we found out and so did he…To see such a big jump so early was clearly a surprise but we knew it was in there physically just something mechanically and mentally was missing. Its great to finally have a program that gets it like yours…..We have tried so many things over the years but nothing has impacted his development and motivation like you have. Just wanted to share this great news and send you a big thanks from both of us…..
Here’s the kicker… Tyler hasn’t even started with our velocity program yet. He is just working on getting connected and getting his tissue prepared for the push that he’ll make in a few weeks. We couldn’t be more thrilled for him! I love it when this happens… and it happens a lot! Are you looking for these kind of results? 1) Attend one of our weekend Elite Performers Boots Camps. We have 2 more camps this off-season. CLICK HERE FOR MORE INFORMATION. 2) Attend a Precision Strike, our one day one on one evaluation and training session. CLICK HERE TO LEARN MORE. 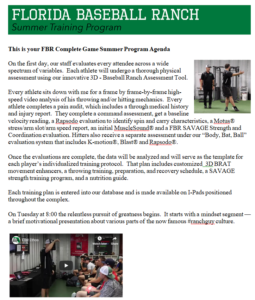 3) Or, sign up for our Complete Game Off-Season Winter Training Program, stay for a more extended period and train in house with our staff. We can’t wait to see you at The Ranch!